The traveller passing through the ancient possessions of the house of Sforza, pauses not to admire the stately duomo, with its myriads of spires and its countless statues, albeit, it is the work of a great artist, and second only to its sister of Florence; he stops not to contemplate the gorgeous spire of St. Charles (the St. Vincent of Paul of his day), glittering with many a costly gem; he will have time to examine them when he returns; but he wends hiis way to the Convent of the Dominicans, and ou the walls of its refectory he sees, defaced by time, the original colors faded, its fair proportions and noble forms disgraced by the pencil of an ignorant artist, the remains of the great work of Leonardo da Vinci, the Last Supper. A sketch of the artist may not be out of place. 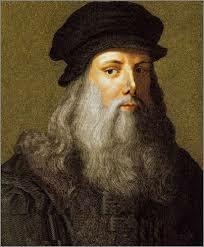 Leonardo da Vinci was born in 1452; the same age which produced such a contellation of talent, Michael Angelo, Lorenzo de Medici, Gorgione, Titian, and Raphael in Italy, Albert Durer in Ger many, and Shakespeare in England; all men of the highest genius, that have left an impression that time cannot efface and who are the ornaments of the human race. Every artist, no matter what his creed or country; every philosopher, whether of the imaginative and somewhat sensual Epicurean school; or of the severer Platonic. the rigid Catholic, or the stern Puritan, worship these models and ac knowledge in them a reflection of the Divine mind and power. Precocity mark ed the youth of Leonardo, and Vasari has carefully preserved the details of his early life with the most gossiping accuracy. His father was a notary, who was en abled to indulge the boy’s love of art, which showed itself almost from infancy; poetry and music were born with him, and he had some idea of painting. With a view of cherishing these pre dilections Leonardo was sent to Andreas Unochio, wlho was famous as a sculptor, painter, and chaser in metal; his style was, however, somewhat hard. Shortly after the arrival of his pupil, Unochio was en gaged on a picture of the baptism of Christ, and he directed Da Vinci to paint one of the angels. The tak was admira bly executed, the richness of the coloring and beauty of the design far surpassing the rest of the picture. Vasari asserts that the master was indignant at being excelled by a mere child; but, it is cer tain, that thenceforward, Unochio threw aside his brush, and confined himself to the chisel and graver. But it was not alone in painting that the youthful artist won fame; architecture and modelling, drawing and chiselling, occupied his attention, and some master pieces produced at that early age, are still in the cabinets of the curious. Florence was not then well watered, and he sub mitted the plan of a canal, which, though not then adopted, was successfully execu ted two centuries later by a disciple of Galileo. It chanced that one of the ten ants of Piero da Vinci had found a circular slab of fig wood, which he brought to his lord’s son, begging him to paint some. thing thereon to decorate his cottage. Le onardo readily assented, and collecting a quantity of toads, serpents, and bats, he composed a sort of monster, with flashing eyes, that seemed as if it were endowed with life, and ready to start from the wood. Piero recognizing the value of the work, sold it for a hundred ducats to a Milanese merchant, who afterward trans ferred it to Sforza for three hundred; but like the cartoon representing a meadow, to be copied in tapestry for the King of Portugal, it has since been lost. He now accepted the invitation of Ludovico Sforza, Regent of Milan, to re side at his court and execute a colossal statue of his ancestor Francesco. He there completed the Last Supper. HIad he painted nothing but this, it would have been sufficient to have transmitted his name to posterity. This work is unparal lelled. The centre figure of the Saviour is of extreme beauty, while grouped around are the other holy twelve. By a master-stroke, and showing the painter’s acquaintance with Eastern manners, the salt cellar has been overturned before Judas. The table furniture and cloth are most exquisite. Tradition affirms that the prior of the monastery was most anxious to have the fresco finished, and wondered that day after day, he still saw the painter with his pencil in his hand, making so little progress, while the laborers in the garden had nearly done the spring work; and complained to the Grand Duke, that the artist was lazy, and that the decoration would never be finish ed, as two heads were still lacking-those of the Saviour and Iscariot. The over tasked brain and overwrought imagina tion of the painter refused, for a time, to labor; the entreaties of the sovereign re called him to his duty. Ho wandered into the country, and re posing for a while under a grape-vine sleep visited him, and he saw floating in mid air, a face of great intellect and be nignity, which he painted, and the prior sat for Judas. The whole story, however, is treated as a fable, in the Storia del Una celo, where the prior is represented ” facie magna, et venusto capite, magno et pro cedente aetate. calvo, capillis que cunis, consperso.”1 Eleven copies of this were made during his life time. The colossal statue of Francisco Sforza, was modelled in clay, and regarded as a wonder of art; the French, during their occupation of Milan, used it as a target, and it was broken to pieces: the profound anatomi cal studies made for it, still exist. War had been adverse to the regent, and he could no longer extend that munificent patronage, for which his house had long been famous; and at the age of forty eight, Da Vinci retired to Florence. Faction had also been busy in his native citv; the Medici had been expelled, but Pietro Soderini, the grand Gorfalou iere received him courteously, and he wat named painter of the republic, with a competent salary. A younger rival, how ever, held the sceptre, and the feuds be tween Leonardo and Michael Angelo, were almost as bitter as the contest be tween Guelphs and Ghibellines, the former was twenty-two years younger than the the latter. Both aspired to the honor of ornamenting the hall of palazzo Vecchio, at Florence. Da Vinci choose as his car toon, the defeat of the Milanese army in 1440; the forms of the horses, the anima ted gestures of the combatants, the mellow coloring, extorted universal admiration. His great competitor selected as his subject, the moment before the same bat tle, when the Florentine soldiers, bathing in the Arno, are surprised by the trumnpet calling them to arms. The preference was given to Leonardo da Vinci, but he spent so much time in preparing the walls, as he preferred oil to fresco, that the de sign was abandoned. Of the drawing of the great architect of St. Peter’s, one copy is still extant, of Leonardo’s not one: from a fragment which existed in his time, Rubens made a drawing, which was engraved by Edelinch, and called ” The Battle of the Standa During his sojourn in Florence, the great artist painted several pictures, one of which is now in the Louvre; but his stless temperament did not permit him to remain long in one place, and invited by Leo X., he visited Rome, more as a machinist and natural philosopher, tha a painter. The great Florentine had introduced any important improvements in the arts, and can be ranked as second Gi otto, if in many respects he do not sure pass him. Age and infirmities now began to steal upon this great genius. Younger artists, particularly Raphael, contested with him the palm of superiority; his spirits failed, and he no longer wrought with the same energy as twenty years before; the pontiff, indignant at his dila toriness, chided him severely; and he re solved to leave the Eternal City. He was, nioreover, galled at the presence of Michael Angelo. Francis I., who had been so victorious in Italy, now held his court at Pavia, and thither he repaired; he was received most warmly, a large pension settled upon him for life, and in 1516 he returned to Paris. Ilis residence in France, though short, was beneficial, but the common foe of mankind claimed his prey, and he expired in that kingdom, in the sixty-seventh year of his age, May 2, 1519. Though r.anking as the first painter of the day, his other attainments were far above mediocrity. In the Ambrosian Library of Milan, there are twelve vol umes of his works, and the late distin guished anatomist, John Ilunter, declares, that they are the most wonderful things he ever beheld for accuracy and beauty. In the library at Windsor, there are three volumes, full of drawings, sketches, and musical airs. In the Hlolkham collection, and the royal library at Paris, there are manu script essays on hydraulics, and his work on painting has been translated into all the European languages. His writing is difficult to read and decipher, as he wrote from left to right. Barry, afterward professor of paint ing in the Royal Academy at London, has left a description of the fresco, in its present condition, which will appropri ately close this article. “W When I came into the Refectorio, I found a scaffold erected, which, on ascending, I saw one half of the picture covered hy n grent cloth, on examining the other part that was uncovered, I found the skin of color which composed the picture, to be all cracked into little squares, about the eighteenth part of an inch, which were, for the most part, in their edges loosened from the wall, and curling up; how ever, nothing was materially injured. I saw that the picture had been formally repaired in some few places, yet as this was not much, and the other parts were untouched, there was nothing to complain of. Three of his pictures are in the Louvre. Some in the possession of Lord Ashburton, and a small Madonna, at the seat of the Earl of Shrewsbury, at Alton Towers. The MIedusa, in the Florentine gal lery, is undoubtedly by his hand, but many of the works attributed to him, more properly belong to the most eminerjt of pupils, Truini and Melzi.